There are many things to watch out for when trying to lose weight. It’s a long and tedious journey. Along the way, there are many products put out there that are really what they claim to be out there. People try to eat better and live a healthy lifestyle. However, there are products catered to that lifestyle that shouldn’t be. They are not as healthy as they seem. In the end, they may cause more harm than good. Low fat food leads to binge eating. When people know they’re taking in fewer calories, they eat more than they should. The problem with low fat food is that manufacturers have to compensate for the taste. Removing fat from foods also take out the flavors. To make them tasty, manufacturers add sugar and other chemicals that are bad for everybody’s health. Natural products are better and good fat can be good as long as fat is consumed in strict quantity. 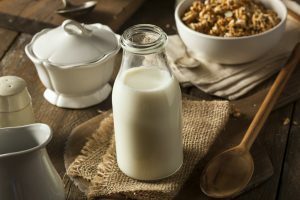 Whole milk is one of those foods, or drinks, that are considered healthy when they truly are not. It contains mostly extra fat and cholesterol. Unless it’s straight from the cow, it’s also processed. It’s not any better than fat free or low fat milk. None of them are bad for a person’s health but, they shouldn’t be anyone’s go-to beverage while they’re trying to lose weight. It’s better to drink skimmed milk or almond milk. Who would have thought? 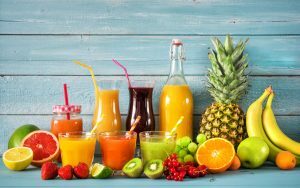 Fruit juices are not exactly one of the healthiest choice at there. It’s not even near the top of the list. Drinking fruit juices is nothing like eating the actual fruit. Even the ones that claim to be 100%. They contain mostly sugar. They are highly process so, it only tastes like the actual fruit. It doesn’t have any of the fiber of a real fruit. It’s better to eat the actual fruit. It will keep the cravings away for a lot longer. Salad is not exactly on the bad food list. It’s mainly fresh spinach and other vegetables. They’re all low calories and provide nutrients the body needs. The problem is the toppings. People rarely eat plain salad. They like to it with croutons, seasoned salts, and dressing. Those toppings are rarely the minimum size. Salad doesn’t agree with people’s taste buds so, they will fill it up with tasty ingredients. Seasoned salts are loaded with sodium that will increase blood pressure. Salad dressing usually comes packed with saturated fat. It’s a better idea to dress the salad with natural ingredients like eggs or avocados. Soy sauce is low in calories but not every food low in calories is healthy. It’s really high on sodium. It can cause high blood pressure and other related conditions. It’s lower in sodium than table salt but even then, it’s not safe to overdo it. It should be used sparingly. The trick about multigrain bread is that there are a lot of ingredients in there. No one is ever entirely sure about everything in it. Not all multigrain bread is 100% whole wheat. It’s always best to check the labels to know what’s in them. Even in that case, there may be some things that the company doesn’t mention. The serving size may not take into account the ingredients on the bread, just the bread itself. Simple whole wheat bread is a safer choice. Most of these products do contain very little calories. If calorie count was the only part of weight loss, they’d be great. As it turned out, there are other aspects to consider in foods. Sugar-free products may be harmful to a person’s health. Their choices of alternative sugar can increase insulin levels. High insulin levels can lead to high blood pressure and complications with cholesterol. It’s better to eat foods with a low quantity of sugar than none at all. These are excellent snacks for busy people. They’re quick and don’t contain many different ingredients. They’re just 100 calories but they are not necessarily giving the right quantity of daily nutrition. They work best as snacks not as a full meal. Fiber is good but not a lot at once. Fiber helps to control cravings and improve digestion without causing any upset stomach. The problem with the snack bars is that they give a large portion at once. It unsettles the person’s nutrition. It’s better to eat foods that are naturally rich in fiber with every meal. It helps to distribute the dosage and the benefits better throughout the day. Fruits are not bad for anyone’s health. They provide necessary nutrients with low calories. However, some of them should be consumed in smaller amounts. Fruits like mangoes and pineapples are high in natural sugars. Eating too much of them can be bad for the health. Popcorn is a great low-calorie snack. They don’t last very long, though. When it comes from a bag, it’s filled with chemicals. Microwave popcorn have been linked to increase risk of developing infertility and thyroid problems. That’s another issue with serving sizes. People are not the best judge of portions especially when the foods come from big packages. It’s best to actually measure out the food to really know how much is being consumed. Losing weight is a worthy struggle but it’s a struggle. It’s all about the portions and the underlying ingredients. Just because a product has less fat doesn’t essentially mean it’s the healthier choice. There are many other factors to consider. It can have higher sodium levels or added sugar. Some of those ingredients may be more harmful to the body than calories. Even though losing weight is the goal, other elements of the body should be maintained. There’s a balance that can destroy the main goal and everything else. It’s always safer to know exactly what is being consumed and how much of it constitute a good serving size.